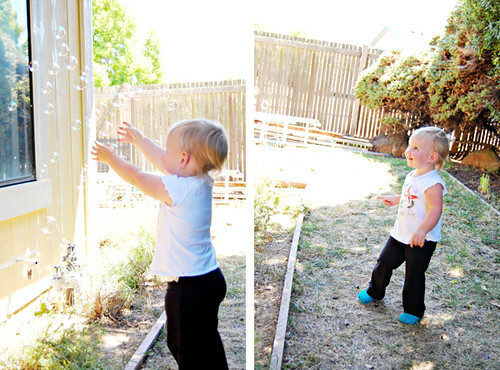 Moving Day for the Family | come blow bubbles! On Friday night, Brandon and I went out to begin helping my sister and brother-in-law move from Concord to Benicia. My dad and I stayed up late painting at the new place while Brandon and Josh packed and my mom and sister took care of the kids. Early Saturday morning I awoke to “meeeeeeooooooooooooow! meeeeeeeeoooooooooow! kitty? mémé? meeeoooooooow!” That was about the moment Claire noticed she was in bed with my mom, and that the cat was at the end of her bed. I came in, and then Jen and Conor came in, and we enjoyed some relaxing time before the chaos of the day began. 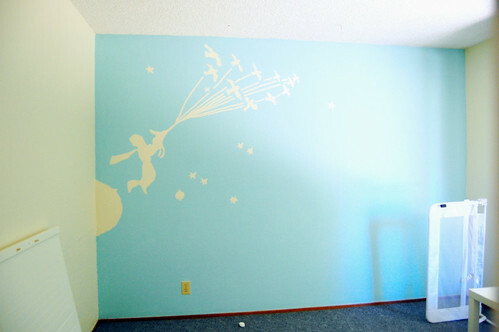 I then went over to the new place to finish painting the mural on the nursery wall–we wanted to make sure Claire felt at home in the new place, so I re-created her previous mural. 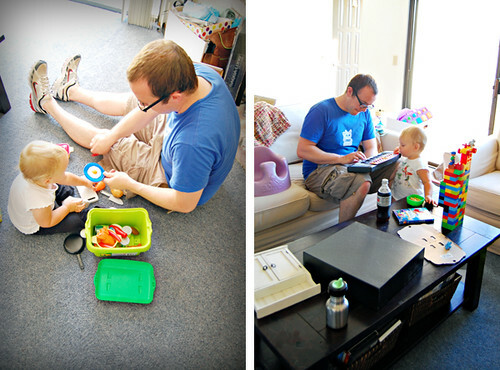 After that was finished up, my new duty began–kid duty. First I snuggled with Conor while Claire took her nap, and then I helped entertain Claire while things were moved and put away. 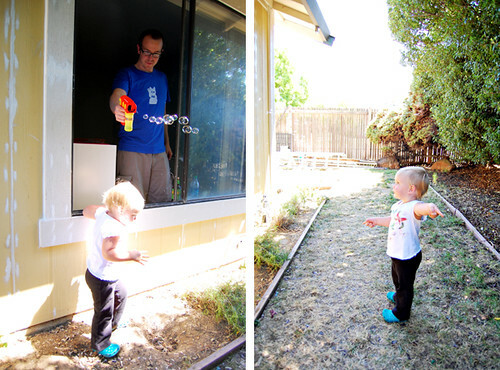 The bubble gun was quite a hit with Claire–especially when she realized there was a room full of people to help blow the bubbles just on the other side of the window. 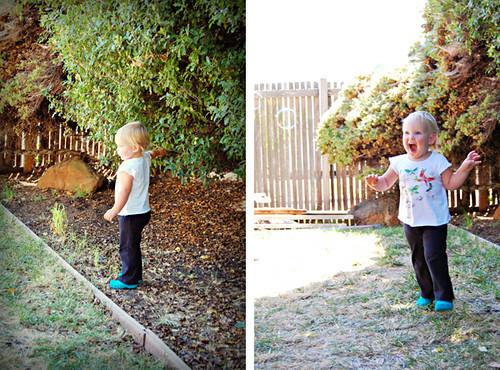 Her biggest request was for Uncle B’s help…this girl sure does love him! Unfortunately I didn’t get any pictures of Conor, due to the fact that I was either holding him or too busy chasing Claire around. 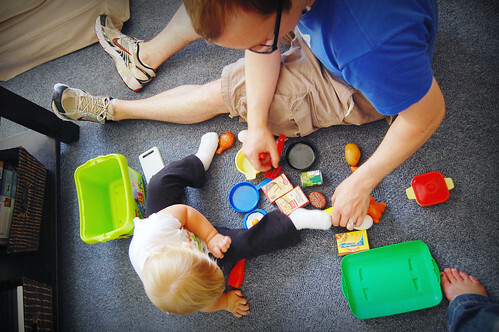 A little bit later, Claire brought out her cooking set in order to put on a little cooking show with–you guessed it–Uncle B. They enjoyed cooking up some hot dogs, a turkey (even though it didn’t really fit properly in the roasting pan), a stack of various ingredients, and my personal favorite–“pegs” as my dad coined them. “Pegs” were peas with an egg on top. Pegs were not a hit with anyone, especially Claire. Claire also enjoyed a little concert by Uncle B on her keyboard. Although the day was a lot of work (okay, who am I kidding–I got the fun job while everyone else worked), Brandon and I had a lot of fun hanging out with everyone and helping Jen and Josh get started in their new place. I’m excited for the opportunities their new home provides–more space, no stairs, more light, a yard, and a lovely neighborhood to take walks in! I can’t wait to visit them soon. One more Claire note–I finally got my first “I love you” from Claire, and it wasn’t even prompted by me! She also requested a kiss and gave me a big hug, including a pat on the back. 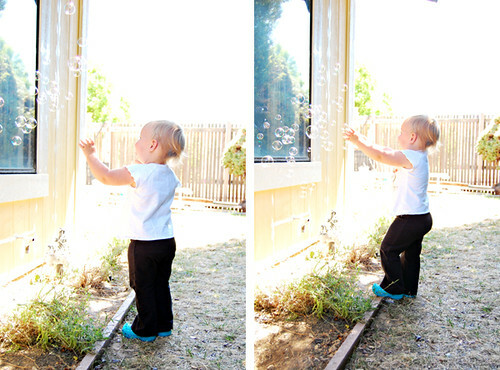 Claire’s 2nd bubble picture is the best bubble picture ever! Where abouts in town did they move? Pretty much the only encouraging part of the housing burst is the prospect of one day being able to buy in a nice neighborhood.